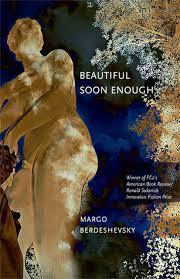 – It is safe to say I have never before read a book quite like Margo Berdeshevsky’s Beautiful Soon Enough, winner of the American Book Review/Ronald Sukenick Innovative Fiction Prize. During the first few pages of the book, I found the analysis-heavy part of my brain kept interrupting, trying to pin down the book into a definable category: was this fiction? Poetry? A novel-in-stories? But this is a book that resists labels. It does not fit into tidy boxes. And, I grew to realize more and more as I continued reading, that is part of what makes this book so striking, so rich, so beautiful. Beautiful Soon Enough is a sensual, dazzling book that explores the complex intricacies of womanhood, motherhood and sexuality. As I read, I could feel the characters’ emotions coursing through my own body: love, desire, anger, fear, hope. This is also a book that begs to be read aloud. When reading, I would often finish a story and go back and read it again, out loud, simply to bask in the glow of Berdeshevsky’s prose. Like this passage on the first page: “Outside, it is Wednesday noon, and beautifully, delicately, snowing. Inside, she is warm and she is at her window. Below in the flying snow, he is watching. She makes a sign with the fingers of one hand, like a butterfly, and he knows he may visit, now.” Reading this makes me feel like I’m peering into a glass snowglobe at a precise tableau. There is so much tension and longing in these sentences—the physical distance between these two lovers, one outside and one inside, one cold and one warm, one asking and one granting… all building up to the satisfaction of the two finally coming together at the end, the distance between these characters evaporating like snowflakes on a coat collar in a heated room. Another thing I love about this book is the evocative black-and-white photographs interspersed throughout the prose pieces. Berdeshevsky’s text and photographs converse with each other across the pages. And as a writer, poet or artist reading this book, the photographs invoke new creation. Beautiful Soon Enough is my favorite kind of book: one that inspires the readers to put pen to paper themselves, creating their own art in response to the stunning artwork they have just experienced. Dallas Woodburn is the 2013-14 Steinbeck Fellow in Creative Writing at San Jose State. Her fiction and nonfiction has appeared in The Mom Egg, The Nashville Review, Louisiana Literature, and The Los Angeles Times, among other publications. Connect with her at http://dallaswoodburnpr.com.